Kids pay close attention to their parents as role models. They naturally observe emotions as indications about how safe they are in the family. Of course, verbal conflict is a normal part of everyday life and also part of a healthy, always evolving relationship between partners. The crucial part is not whether or not parents fight in front of their children, it is how the conflict is expressed and ultimately how it is resolved. Witnessing some kind of arguments can actually be beneficial for children over 5: If they see their parents expressing themselves in healthy ways and resolve difficult problems together, they can grow up to be more diplomatic problem solvers. What is considered destructive fighting? Some parents may believe that they can avoid negatively affecting their children by giving in, or surrendering, to end an argument. But that is not a problem-solving tactic. Children will see that you are pretending and in some ways that is even worse. In a partnership, you can’t resolve a conflict you’re not even acknowledging in the first place. Your children will know it’s there, you’ll know it’s there, and no progress will be made for anyone involved. If you openly navigate conflict in your relationship well, your offspring will benefit. It is a great thing and a natural learning process for them to overhear how you respectfully express yourselves, work things out together, and negotiate and compromise your way through it. How can conflict in front of the kids be a positive thing? Try not to point fingers. Remember that you’re both on the same team and deal with issues by sharing all the information. Look at the situation together rather than blaming each other. Lead the conversation with empathy and the benefit of the doubt. Start the conversation by letting your partner know that you hear them, you understand them, and you can put yourself in their shoes. Whatever needs to be said can be said with kindness and respect. Of course, the hardest part about arguing is not letting your hurt and anger take over but expressing your disappointment with calm and kindness will get you farther in joint problem solving. 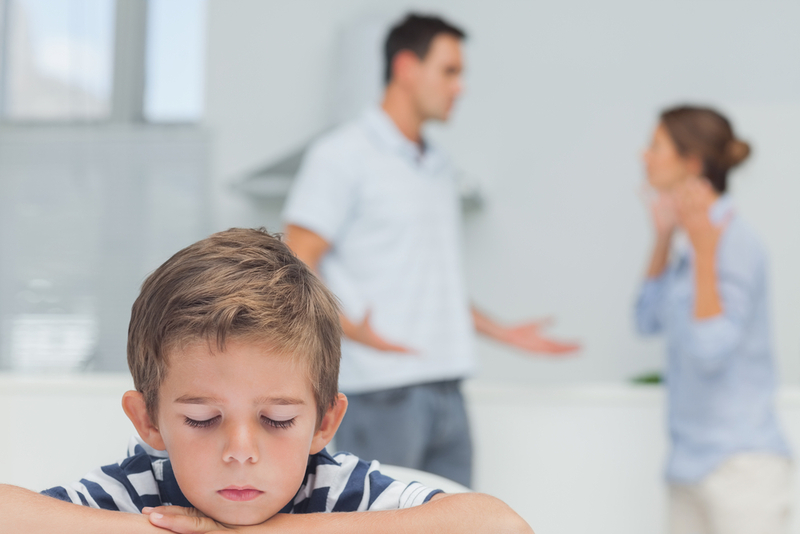 If your children see you arguing, discuss it with them, without pulling them in to take sides or discussing the issue. You can say that mom and dad are upset with each other in that moment, but you still care for each other and will not stay angry. This way they know that it is okay for you or them to feel upset and angry at times, but this feeling will get resolved. Learn how to better communicate and develop healthy conflict resolution patterns with the help of a couples counsellor. Set up an appointment with Vaughan Relationship Centre today.